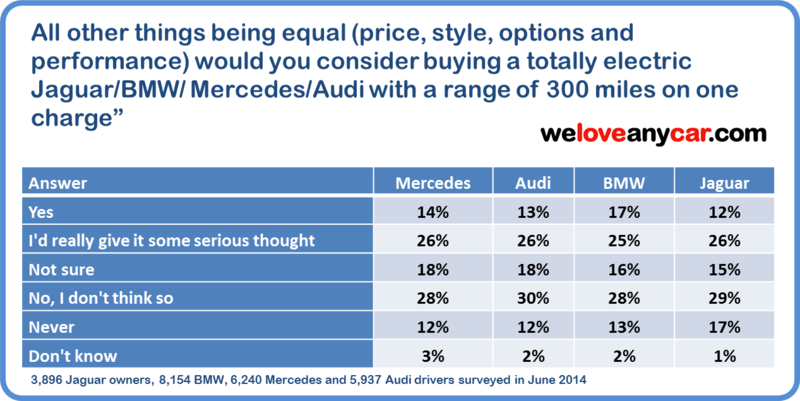 WeLoveAnyCar.com: 40% of Jaguar, Audi, BMW and Mercedes Owners: "We'll Buy Electric"
40% of Jaguar, Audi, BMW and Mercedes Owners: "We'll Buy Electric"
Nearly 40% of BMW, Audi, Mercedes and Jaguar drivers said they would buy, or seriously consider buying, an all-electric car capable of 300 miles from one charge from their brand. Electric cars can accelerate faster, are quieter, better for the environment and now their range is climbing fast - but who would buy them? WeLoveAnyCar.com surveyed 24,227 owners of prestige cars and the results suggest the market for all electric cars is ready to move from the ‘eco-shadows’ to the mainstream and possibly become the one of the most important car market sectors in the next 10 years. Currently, only the US-made Tesla boasts range and performance figures considered in the survey but now solid evidence exists that the European brands’ investment in all-electric technology could be a way to increase sales and retain customers. The Survey - Shock Results? Would You Buy an All-Electric Car with a Range of 300 miles? Only 12 to 17% of all respondents said they'd never buy an electric car with a 300-mile range. BMW is arguably ahead of the electric race with a multi-million Euro investment in electric technology. They have clearly done the research and see the size of the market becoming the key battleground for the prestige driver. Investment Available For New Entrants? Tesla, the most advanced all-electric car manufacturer, have recently announced that they are happy to share technology, helping both major car companies and, perhaps, new start-up automotive manufacturers alike. It can’t be long before the market potential, access to technology and governments with ambitious emission-reduction targets attract major investment from the deep pockets of the investment community. Big Budget Buyers - Ready To Switch? Our 132,872 car owner reviews have major themes; the most popular being fuel economy. This survey shows that fuel economy is just as attractive to the motorists with high disposable income as those on a tighter budget. Oh its awesome as we all know about the electric cars. These are very efficient cars so people move from the fuel cars to the electric because they know about its advantage. I am also with in these forty percent people.Nice work done on this blog, its really very interesting. However,if you want to check the Vin of your car so have a look on BMW VIN Decoder.